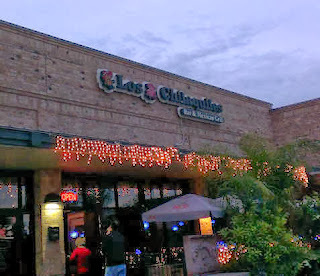 This is, as the name suggests, a Mexican restaurant, and is one we return to fairly regularly. We have rarely been disappointed in the service, and while a lot of the menu is not to my taste, there are many items I do really enjoy. I just need to remember to stick to what I know and like. 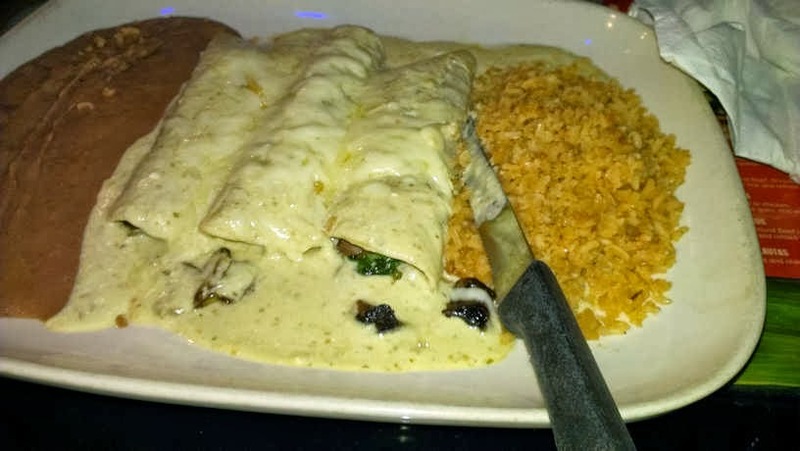 On our most recent visit I forgot to do that and my love of mushrooms and spinach, particularly together, overcame my reservations about enchiladas, which I know I don't like, for much the same reason I do not like pizza, I know - unAmerican, I have been told that many times. 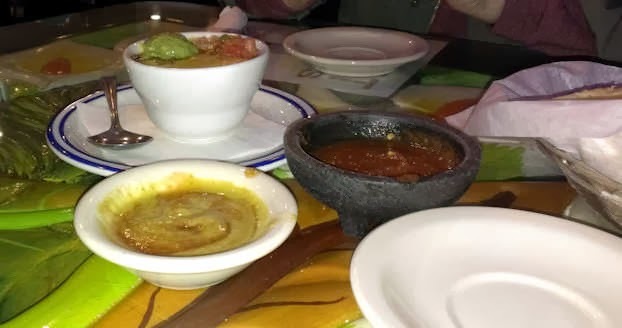 We were served chips and salsa, and we have been there often enough to know to ask for their 'green salsa'. This is only served on request and is so much better than the tomato based salsa which they serve warm. 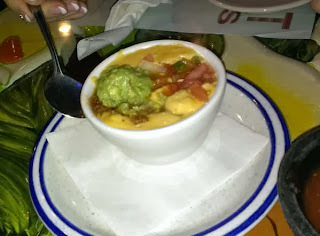 We started with the Queso Albanil which I had enjoyed before, but this time I had one taste and that was too much. This dish is layered ground beef at the bottom, covered in melted cheese with pico and guacamole on top. I think it was because Mildred, before I could stop her (I was too busy taking photographs) mixed it all together, I do prefer to be able to taste each of the layers separately and there was no way to avoid the strong, salty flavor of the beef which overpowered the rest of the flavors once it was mixed. I recommend you try this Queso, but taste it before mixing it, in fact, if you are sharing with others, put some on your side plate and then mix it if that is the way you like it. The main course was served promptly and efficiently. We were all having enchiladas which may have helped there, my husband and his mother had beef and I had the spinach and mushroom, unfortunately the spinach and mushroom was so heavily dowsed in lime juice, that was all I could taste. Note to self, order the Filete al Vapor next time. It is worth the 20 minute wait, though I do feel bad making my companions wait that long. Come to think of it, I didn't see it on the menu this time! Oh dear. Still, they do some good salads also. And this time they did have Cabernet, and it was served at room temperature, so all was not lost. Don't let my bad choice and fussy tastebuds stop you from paying a visit to Los Chilaquiles, both Mildred and Larry thoroughly enjoyed their food. Although the decor is somewhat gaudy, it has a pleasant atmosphere, good service, good food and good prices. By the way, you might have noticed, we do not eat desserts, hence no commentary on those.